Out of Belize's hundreds of islands Ambergris Caye is the largest one almost 40 km (25 miles) long in Belize and also the most popular tourist destination: over half of the visitors to Belize come here only and most of them are divers. Ambergris Caye has a laid-back atmosphere and the classical view of a Caribbean island: white beaches, crystal-clear waters, palm trees and no traffic. There are no high-rise hotels. Getting around the island is either done by walking, biking, water taxis or golf carts. 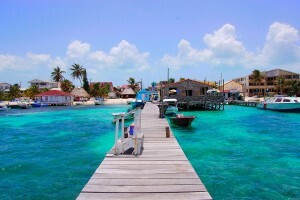 The only town on Ambergris Caye is the quaint town of San Pedro, a former fishing village. It has a population of around 10,000 and despite the rapid (tourism) development it is still a nice, relaxed place. Hotels and facilities are excellent and there is a large string of beachfront cocktail bars and nightclubs. The tropical attitude, sparkling night live and sandy streets often remind people of Key West from a few decades ago. Note that due to its popularity and the rapid development, San Pedro is becoming more expensive. If you are on a small(er) budget consider staying at Caye Caulker, just south of Ambergris Caye.